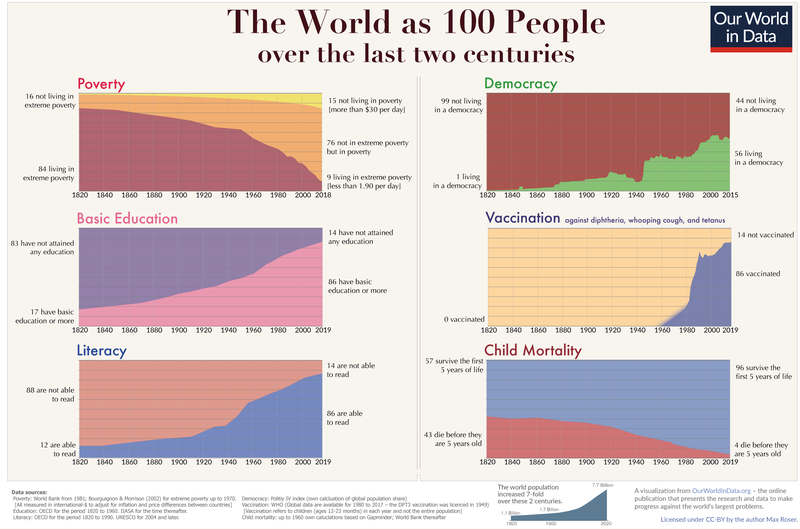 This is an introduction to Our World in Data – the web publication that shows how global living conditions are changing. To see where we are coming from we must go far back in time. 30 or even 50 years are not enough. When you only consider what the world looked during our life time it is easy to make the mistake of thinking of the world as relatively static – the rich, healthy and educated parts of the world here and the poor, uneducated, sick regions there – and to falsely conclude that it always was like that and that it will always will be like that. Researchers measure extreme poverty as living with less than 1.90$ per day. These poverty figures take into account non-monetary forms of income – for poor families today and in the past this is very important, particularly because of subsistence farming. The poverty measure is also corrected for different price levels in different countries and adjusted for price changes over time (inflation) – poverty is measured in so-called international dollars that accounts for these adjustments. The first chart shows the estimates for the share of the world population living in extreme poverty. In 1820 only a tiny elite enjoyed higher standards of living, while the vast majority of people lived in conditions that we would call extreme poverty today. Since then the share of extremely poor people fell continuously. More and more world regions industrialised and thereby increased productivity which made it possible to lift more people out of poverty: In 1950 three-quarters of the world were living in extreme poverty; in 1981 it was still 44%. For last year the research suggests that the share in extreme poverty has fallen below 10%. That is a huge achievement, for me as a researcher who focusses on growth and inequality maybe the biggest achievement of all in the last two centuries. It is particularly remarkable if we consider that the world population has increased 7-fold over the last two centuries – switch to the ‘Absolute’ view in the visualisation below to see the number of people in and out of poverty. In a world without economic growth, such an increase in the population would have resulted in less and less income for everyone; A 7-fold increase in the world population would have been enough to drive everyone into extreme poverty. Yet, the exact opposite happened. In a time of unprecedented population growth our world managed to give more prosperity to more people and to continuously lift more people out of poverty. Economic growth was also so very important because it changed the relationship between people. In the long time in which the world lived in a non-growth world the only way to become better off is if someone else got worse off. Your own good luck is your neighbours bad luck. Economic growth changed that, growth made it possible that you are better off when others become better off. The ingenuity of those that built the technology that increased productivity – the car, the machinery, and communication technology – made some of them very rich and at the same time it increased the productivity and the incomes of others. It is hard to overstate how different life in zero-sum and a positive-sum economy are. Unfortunately the media is overly obsessed with reporting single events and with things that go wrong and does not nearly pay enough attention to the slow developments that reshape our world. With this empirical data on the reduction of poverty we can make it more concrete what a media that would report global development would look like. The headline could be “The number of people in extreme poverty fell by 130,000 since yesterday” and they wouldn’t have this headline once, but since – on average – there were 130,000 people fewer in extreme poverty every single day they should have had this headline every single day since 1990. How did the education of the world population’s change over this period? The chart below shows the share of the world population that is literate over the last 2 centuries. In the past only a tiny elite was able to read and write. Today’s education – including in today’s richest countries – is again a very recent achievement. It was in the last two centuries that literacy became the norm for the entire population. In 1820 only every 10th person was literate; in 1930 it was every third and now we are at 85% globally. Put differently, if you were alive in 1800 there was a chance of 9 in 10 that you weren’t able to read – today more than 8 out of 10 people are able to read. And if you are young chances are much higher since many of today’s illiterate population are old. If you think science, technology, political freedom are important to solve the world’s problems and you think that it helps to read and write to do this then look at the figures in absolute numbers. In 1800 there were 120 million people in the world that could read and write; today there are 6.2 billion with the same skill. The huge majority of those living in an autocracy – 4 out of 5 of those that live in an authoritarian regime – live in one country autocracy: China. Now that we see fertility declining everywhere we come to an end of population growth: The global population has quadrupled over the course of the 20th century, it will not double anymore over the course of this century. And at the end of the century the UN expects a slow annual population growth of 0.1% whereas the demographers from IIASA expect an end of population growth around the year 2075. None of the achievements over the last 2 centuries could have been achieved without the expansion of knowledge and education. The revolution in how we live was not only driven by education it also made education more important than ever. Focussing on the educational breakdown the projection suggests that by 2100, there will be almost no one without formal education and and there will be more than 7 billion minds who will have received at least secondary education. VII. Why do we not know this? The motivation for this history of global living conditions was the survey result that documented the very negative perspective of global development that most of us have. How does that fit with the empirical evidence? I do not think they are the only ones to blame, but I do think that the media is to blame for some part of this. This is because the media does not tell us how the world is changing, it tells us what in the world goes wrong. One reason why the media focusses on things that go wrong is that the media focusses on single events and single events are often bad – look at the news: plane crashes, terrorism attacks, natural disasters, election outcomes that we are not happy with. Positive developments on the other hand often happen very slowly and never make the headlines in the event-obsessed media. The result of a media – and education system – that fails to present quantitative information on long-run developments is that the huge majority of people is completely ignorant about global development. Even the decline of global extreme poverty – by any standard one of the most important developments in our lifetime – is only known by a small fraction of the population of the UK (10%) or the US (5%). In both country’s the majority of people think that the share living in extreme poverty has increased. Two thirds in the US even think the share in extreme poverty has ‘almost doubled’. When we are ignorant about global development it is not surprising that few think that the world is getting better. here you can download the 200 year chart in high resolution. There are big problems that remain. None of the above should give us reason to become complacent. On the contrary, it shows us that a lot of work still needs to be done – accomplishing the fastest reduction of poverty is a tremendous achievement, but the fact that 1 out of 10 lives in extreme poverty today is unacceptable. We also must not accept the restrictions of our liberty that remain and that are put in place. And it is also clear that humanity’s impact on the environment is at a level that is not sustainable and is endangering the biosphere and climate on which we depend. We urgently need to reduce our impact.